Mayonnaise is a simple sauce, made by combining egg yolks and oil. It is used widely — from salad dressings, to spreads, to dips. It’s very quick, easy, and safe to make — and the homemade version is a far, far better sauce to make than you can ever buy. There’s really no excuse for bottled mayo. Aioli is just a spiffed-up version of mayonnaise, with garlic, lemon, and sometimes herbs. You can play around with almost any combination of oils, and seasonings, and make spectacularly good aioli, in about 5 minutes. 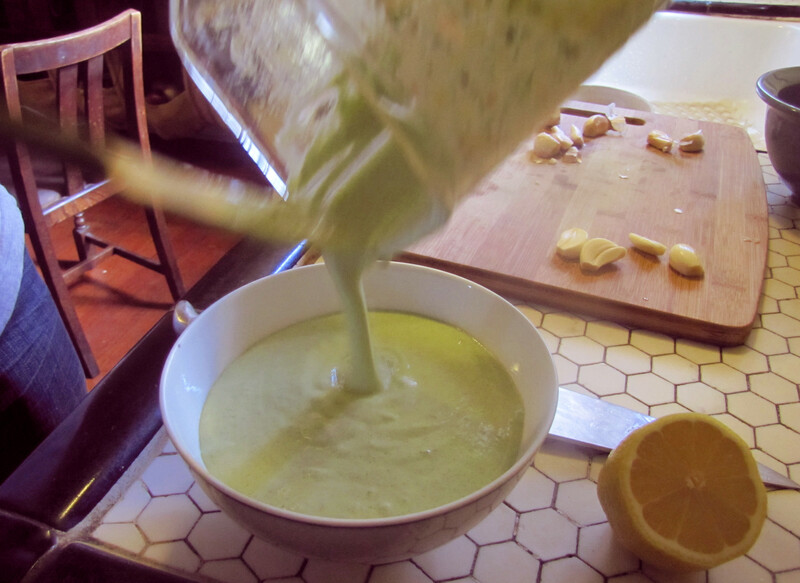 When Maggie lived at the Normandie house, she made aioli regularly (we ended up calling it Maggie sauce). At some point, we had to tell her she was forbidden to make it again, because we were eating it by the spoonful, right out of the bowl. There are two basic approaches to homemade aioli. The first, is the traditional approach, with a whisk. 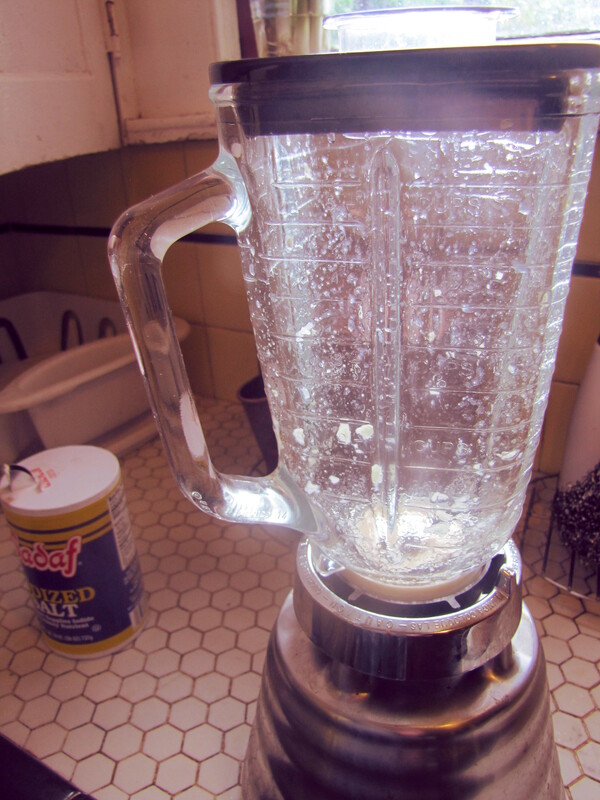 The less labour-intensive version uses a blender or a food processor. Either way, the idea is the same. 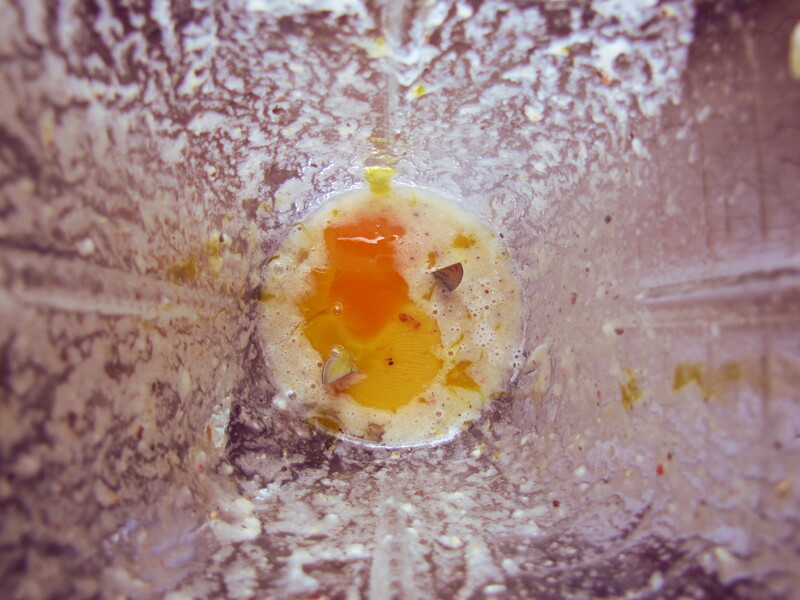 You need to start slowly, emulsifying a tiny amount of oil in an egg yolk. As you proceed, you can add oil more quickly. You can use either just the egg yolk, or a whole egg. Egg yolk is more traditional, but some of us (Brad) can be a bit lazy. Sorry if the idea of raw egg freaks you out. You’ll just have to deal with it. If it’s any consolation, though, the garlic and acid (vinegar or citrus juice) of aioli probably will kill any salmonella, before the salmonella kills you? Straight up extra virgin olive oil is too strong for most uses. 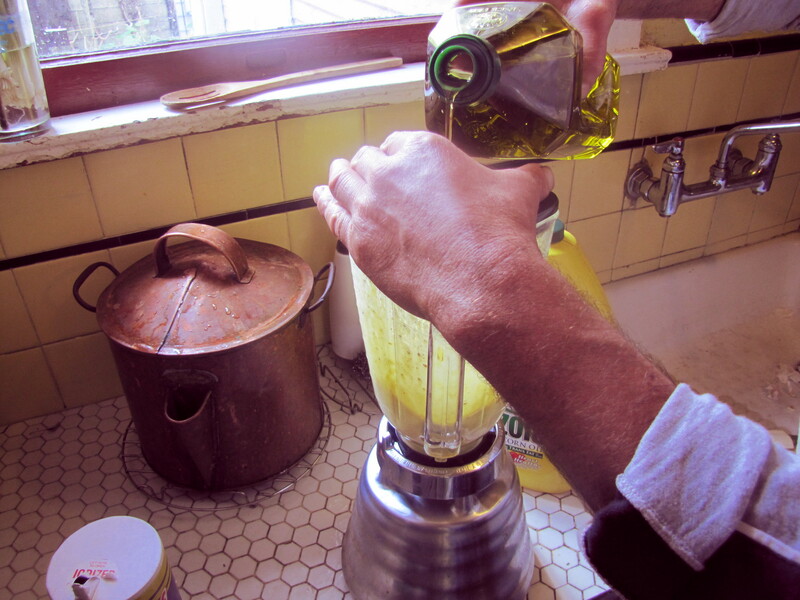 We either use light vegetable oil, or a 1:1, vegetable: olive oil blend. We tried mustard oil, once, and it was damn near toxic. Avoid. – pretty much anything else you want. In a blender or food processor, purée together your optional ingredients (vinegar, mustard, garlic, etc. — but save any herbs to add later), with a little water as necessary to make a paste. Add the egg, or egg yolk and salt. Blend these ingredients together really well. Add just a drop or two of oil, and purée this very well. This is the critical stage — for the first bit, go slowly adding oil a couple drops at a time, puréeing between each addition. This produces what’s called an emulsion — the proteins in the egg yolk grab onto the oil, and form a substance that lets water and oil hang together instead of separating out. This property of emulsions is what makes mayonnaise such a popular component of salad dressing. Keep adding oil a few drops at a time, and emulsifying until you’ve combined 2 tbsp (30ml) of the oil with the egg. At this point, you can accelerate the process, pouring the oil in a thin stream, and running the blender the whole time. The mayonnaise should be combining well, at this point. If the oil starts to separate, stop adding the oil so quickly. If it refuses to combing, the mayonnaise has broken. Follow the instructions below. When you’ve added about half the oil, throw in the herbs (if you’re using them) and keep going. As you’re going, the mayonnaise will start to get very thick, almost solid. At the end add a little water, maybe a tablespoon, to thin it out, and give it at a nice consistency. When it’s done, you can use it immediately, or keep it in the fridge for a week or two. The flavour of garlic and herbs will be stronger if you wait a day before using the aioli. In case of breaks: If the mayonnaise “breaks” (that is, the oil and liquid stop combining) don’t panic. Just put the dodgy sauce into a bowl, and rinse out the blender. Throw another egg, or egg yolk back in, and start again — using the broken mayo in exactly the same way as you would use plain oil. Begin slowly, one or two drops at a time, until the mayo starts to form. Additions: Common additions to mayonnaise/aioli include spices like wasabi, mustard (grainy or smooth), chiles, garlic, or pepper; an acidic component like vinegar, lime juice, or lemon; and other ingredients like sugar. Less common additions include herbs (cilantro, or parsley), soy sauce, or chipotle. You can use any oil you like — olive oil is common for aioli, light vegetable oil for mayo, and we sometimes season aioli with a little sesame oil, for Asian-style salads. Uses: Aioli is great on burgers, with french fries, or served with chicken. It works in potato salad, and devilled eggs. It’s amazing in Cesar dressing, and on sandwiches.